Lewes Bed and Breakfast | Welcome to our independent Lewes Town and Country Bed and Breakfast Group. We provide attractive, clean, comfortable and reasonably-priced accommodation in friendly homes for visitors who wish to stay in Lewes, or in its surrounding villages. There are several properties offering bed and breakfast and/or self catering options in both town and country. Some of our properties use online booking – check availability and book direct here..
Or please see all of our lovely b & b’s and self catering properties below..
Lewes is a buzzing, historic market town. It has a superb Norman Castle, an 11th century Priory, independent small shops, fine real ale pubs, restaurants and cafes, its own Harvey’s brewery and of course the famous Lewes Bonfire night celebrations. The surrounding villages are pure Sussex at its best. Country pubs, open fires, Morris dancers, chalky walks, enchanting gardens, not forgetting the stunning coast of the Seven Sisters and Beachy Head. LOOKING FOR A B&B IN LEWES? OR THE SURROUNDING COUNTRYSIDE? We offer over 50 delightful B&Bs and self-catering possibilities to choose from. We are all independently inspected, offer a friendly welcome, a comfortable stay and delicious breakfasts. Most have free Wi-Fi. Click here for a B&B in Lewes and here for a B&B in the countryside around Lewes. 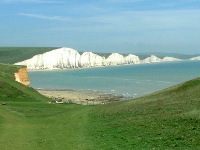 Click here for self-catering in Lewes and here for self-catering in the countryside around Lewes. There is something for everyone : whether you are looking for a peaceful retreat in a pretty Sussex village, a night at Glyndebourne Opera, a dip into the fascinating lives of the Bloomsbury set at Charleston Farmhouse, a stop over along the beautiful South Downs Way, antiques at the Ardingly Antiques & Collectors Fair, jazz at the Love Supreme festival at Glynde, car and horse racing at Goodwood, delightful gardens, parkland and woodland at Sheffield Park, steam trains at the Bluebell Railway and the Lavender Line, vintage aeroplanes at the Eastbourne Air Show or a visit to one of the many antique centres in Lewes town. 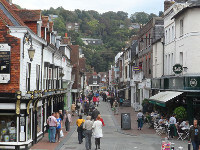 Lewes is a buzzing, historic market town in the South Downs National Park. It has a superb Norman Castle, an 11th century Priory, independent small shops, fine real ale pubs, restaurants and cafes, its own Harvey’s brewery and of course the famous Lewes Bonfire night celebrations.